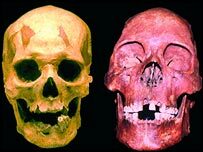 The skulls (r) are long and narrow, not in keeping with Native Indians' broader, rounder features. Some of the earliest settlers of America may have come from Australia, southern Asia, or the Pacific, new research suggests. Traditional theories have held that the first Americans originated from northern Asia. Dr Silvia Gonzalez conducted a study of ancient bones found in Mexico and found that they have very different characteristics to Native Americans. The results are being presented at the BA Festival of Science this week. Some of the ancient skulls she has looked at are more than 12,000 years old. These skulls have long and narrow heads that are very different from the short, broad skulls of today's Native Americans. One particularly well-preserved skull of a long-headed female, who has been dubbed Penon Woman, has been carbon dated to 12,700 years ago. "They appear more similar to southern Asians, Australians and populations of the South Pacific Rim than they do to northern Asians," Dr Gonzalez, of Liverpool John Moores University, told the British Association's annual meeting in Exeter. "We think there were several migration waves into the Americas at different times by different human groups." Dr Gonzalez said the research would be controversial. "[Native Americans] cannot claim to have been the first people there," Dr Gonzalez said. She also hinted that DNA recovered from Penon Woman would corroborate measurements of the skulls. "We have extracted her DNA. It is going to be a bomb," Dr Gonzalez commented. Recently, a coalition of native tribes lost their claim to the remains of Kennewick Man, a 9,000-year-old skeleton found in Washington State. The case was won by a group of scientists who wanted access to the remains for study. A population of the long-headed individuals being studied by Dr Gonzalez had survived into historic times, she claimed. The results concur with a study of the Pericues carried out by Spanish researchers in 2003. This also used measurements of the skulls to show that this population was only distantly related to contemporary Amerindian groups. However, some scientists think that the older group of Americans may simply have evolved the features typical of present-day natives of the continent. One study has shown marked differences in the skull shape of prehistoric and present-day Inuit populations despite the fact their mitochondrial DNA types were very similar.